Princess Pinecone is a warrior. But when you live in a land FULL of big, tough warriors, and you are rather small, super sweet and very cute, it can be hard to be taken seriously. And Princess Pinecone has serious issues with not being taken seriously. She is sick of receiving cosy sweaters for her birthday - 'warriors do not need cosy sweaters' - so this year she specifically asked for a big, fast, strong warrior's horse. Her parents try (oh they really do!) but still don't get it quite right, so Princess Pinecone receives a cute, adorable, roly-poly pony who farts too much. She tries to make do, but when the day of the big battle arrives - you see 'battling is a warrior's favourite thing to do' - she can't seem to quite find her way into the commotion. Princess Pony despairs, but then her pony starts to attract the warriors' attention. She is so cute that they can't help but coo and fawn all over her. It is then that the warriors lament that they 'don't often get to show our cuddly sides'. It just so happens that Princess Pinecone knows just how to help these big, tough warriors embrace their softer, cosier sides! 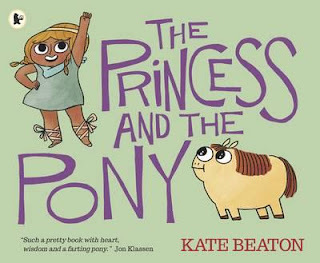 The Princess and the Pony is a funny and adorable little story about embracing your strengths.With illustrations featuring some truly fierce warriors, the most delicious range of soft, cosy sweaters, and a heroine that is too cute for words, this story will delight little boys and girls of all ages.